At the war's end, families faced difficult decisions on where to go next -- many had to begin anew. Forty percent of the Nikkei community members returned to the area after World War II. Many families had nothing to go back to. They had lost everything that was home in Hood River, and decided to live elsewhere. Some were so heartbroken by the vocal opposition that they never returned. Those who did return were not welcomed at first, but they persevered. Some came back to find possessions sold or trashed, their land poorly tended. Some farmers had difficulties and had to ask their white neighbors to deliver their fruit. 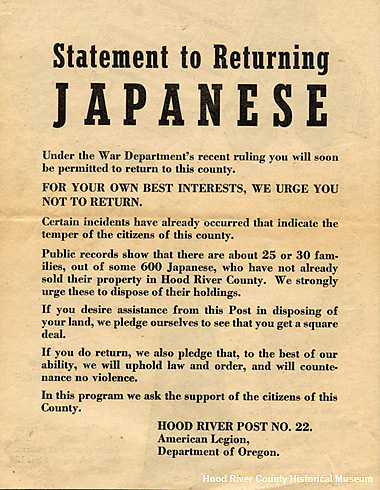 Photo: Courtesy of Hood River County Historical Museum.